New Crop Circles at Chicoana Argentina! Several days ago, circles and other geometric shapes appeared in the wheat fields. Today, there are claims that a strange circular object flew over the area -- sometimes at very low altitude. Several residents of the town of Chicoana in Salta -- where circles and geometric figures appeared only days ago -- claimed having seen a strange circular object flying over the area at very low altitude. The alleged UFO was described by the witnesses -- some were even able to take photos and record video -- as a round object that changed color constantly. "The object was very odd. It changed colors at every instant from red to green before losing itself in the mountains after being visible for several seconds," said José Morales, a witness to the aerial phenomenon over Route 33 last Thursday. In an interview with Diario El Tribuno, the man said that the UFO "was round and not very large. Many were able to see it. After returning a few times, it vanished to the south of Chicoana." Olga Chocobar and her nephew were also able to see it on Wednesday and Thursday from Barrio la Rotonda. "There was a very bright light moving from one side to another at low altitude and in the same area. Two days in a row. At times it floated and moved quickly at others. It changed colors, dimmed and then reappeared somewhere else," said the local resident. 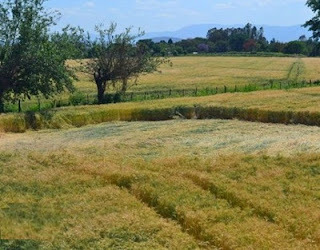 Last weekend, the fields of Chicoana, 35 kilometers from the capital city of Salta, also witnessed the appearance of strange shapes in the wheat, as occurred three years ago in other rural areas of the region. This time, circles measuring some ten meters in diameter were added to the figures, similar to the Crop Circles that appeared in England in the late '70s ane were later found in various parts of the world, causing speculation that ranges from ufology to fraud and outright pranks. Probing a Possible 'UFO Origin' for the Monte Grande Explosion? WERE THE ONE-EYED ALIENS IN LAGUNA BLANCA CYCLOPSES?